It’s easy to fall in line with this effortless yet stunning home decor trend. Simplify your space with minimal design and thin lines for a big impact. It might seem counterintuitive, but less truly is more when it comes to graceful design. Delicate patterns with symmetrical lines and simple finishings create a look that lets your space speak for itself without the distraction of too much clutter. It’s easier than you think to create a minimalistic look that evokes modern elegance and simplicity. An elegant light fixture can change the entire aesthetic of a room. When you select a piece with clean lines, simple ironwork, and modern details, you create a space that feels contemporary and sophisticated. If a room has an intimidatingly tall ceiling, fill it with a large chandelier like the Aidan Gray Home Lighting Chan Geo Collection Look # 9 Chandelier or the Currey & Company Lighting Metro Rectangular Chandelier. These stunning light fixtures feature large frames, but the simple lines and finishings create a sleek and modern look that doesn’t weigh the space down too heavily. For over dining or kitchen tables, try the Currey & Company Lighting Firefly Rectangular Chandelier or the Currey & Company Lighting Bolthole Chandelier. These chandeliers might seem large in scale, but their simple designs and clean details balance them out to perfectly complete space. 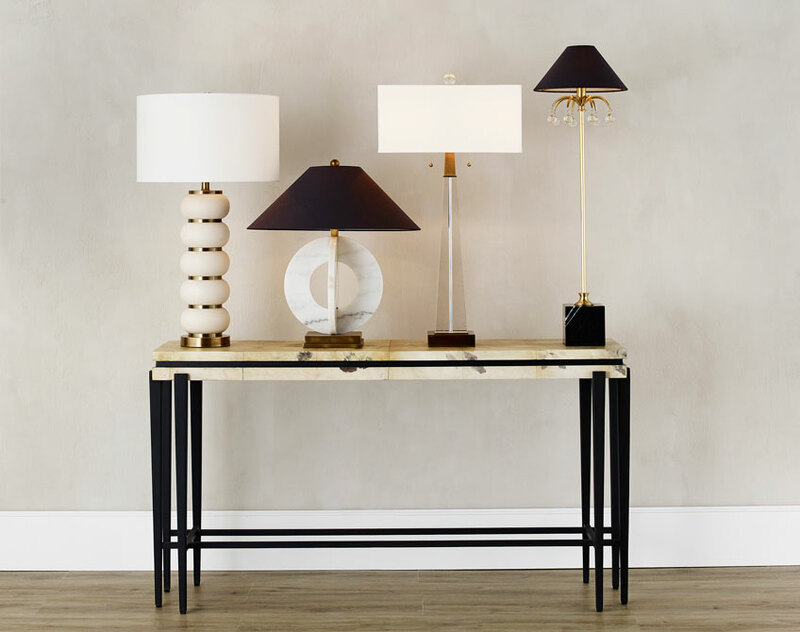 In addition to light fixtures, table and floor lamps can also feature the fine line trend. The Currey & Company Lighting Nikkeru Floor Lamp is sleek and modern with timeless flair. The Chelsea House Lighting Castle Urn Lamp mixes both modern and traditional style with sleek lines on a classic ceramic lamp base. For furniture, accent and side tables work well in rooms to provide function with minimal visual weight. 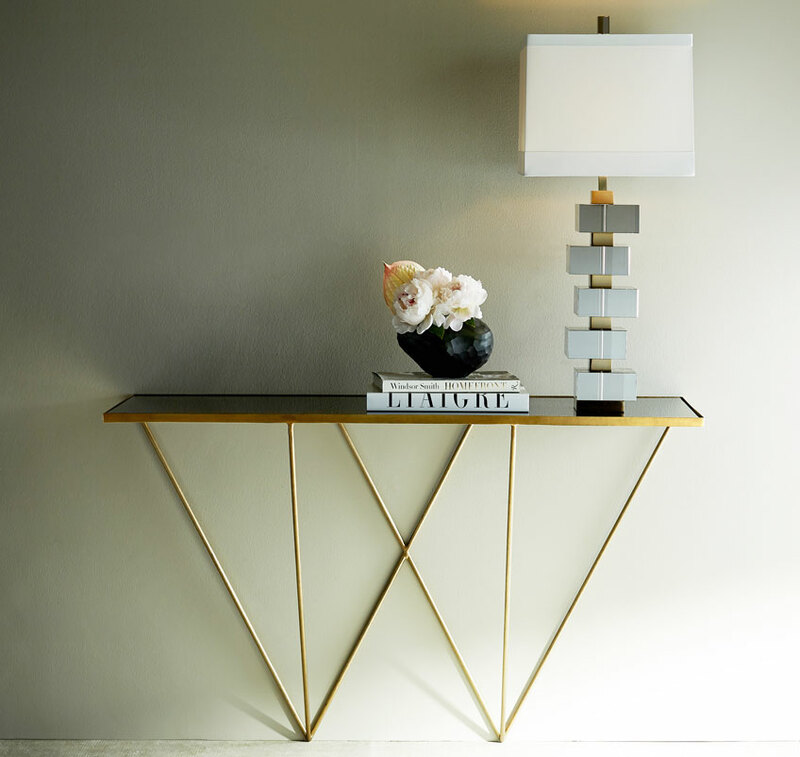 The Arteriors Home Kaela Rectangle Accent Table features clean lines and gold accents, but the simple design keeps the room feeling light and modern. You can place a piece like the Regina Andrew Design Home Baxter Thin Etagere in a corner where you need storage, but don’t want to make your space appear too cluttered. The Regina Andrew Design Home Isosceles Table is the perfect side table to a heavier chair to balance out the visual space. Throw a few accent pieces like the Regina Andrew Design Home Trellis Star Large or the Regina Andrew Design Home Brazed Spike Ball Large on a mantle or coffee table to continue the theme of modern elegance throughout your entire space. Don’t forget about your floors! 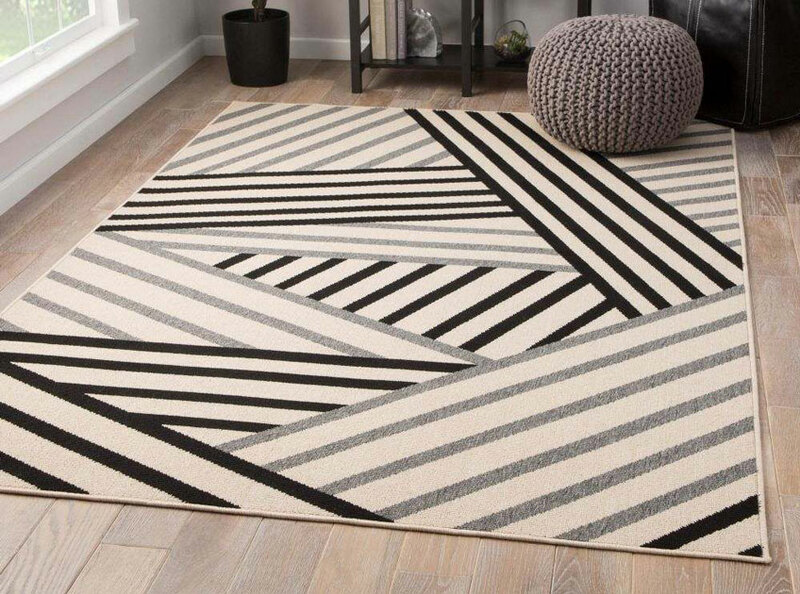 You can utilize the fine line trend to add visual depth with the addition of geometric rugs. Minimalistic rugs like the Jaipur Begley Rug from Patio Collection in Black & Gray or the Jaipur Minya Rug from Decora by Nikki Chu Collection in Silver & Black add a modern elegance with a flair of style with the contrasting black and white stripes. Looking for a more neutral palette? Try the Jaipur Navonna Rug From Hollis Collection in Cobblestone & Pewter or the Jaipur Verino Rug From Lounge Collection - Bungee Cord & Oatmeal for a rug that keeps things neutral while still adding visual interest with a subtle lined pattern.